This is a modified version of the paper presented by the author at the Public Hearing against militarism: United Struggles against Militarisation from Latin America to Palestine, held in Rio de Janeiro on July 27 2018. “In a brilliant shift in imaging, Israel has managed to turn 50 years of Palestinian resistance to occupation into a cottage industry. By labeling it “terrorism,” it has not only delegitimized the Palestinian struggle but has transformed the occupied territories in a laboratory of counterinsurgency and population control, the cutting edges of both foreign wars and domestic repression. It has transformed tactics of control and their accompanying weapons of surveillance systems into marketable products”. He further argues that “(t)he Security State being promoted by Israeli Government is apolice state whose populace is easily manipulated by an obsession with security. Israel has been marketing itself as a model for suppressing/pacifying the Palestinians, witness the strong-arm methods used to silence unarmed protestors.”This has spawned a Homeland Security industry. No other country has such a large pool of experienced former security, military and police personnel and no other country has been able to field test its systems and solutions in real-time situations. India’s trade relations with Israel are dominated by two commodities: military wherewithal and diamonds, with potash a distant third. Until 1992 diamonds dominated the trade and even today it accounts for 53% of merchandise trade. Buttrade in military and security sector has emerged as the most vital of trade ties. Indeed by 2017India became the largest buyer of Israeli military equipment by purchasing 49% of the total Israeli military exports, which is more than what Israel itself buys, although India sources only 12% of its military imports from Israel, third after Russia 62% and US 15%. Annexure shows the list of items India buys from Israel. Israel rendered limited military assistance to India in its 1962 war with China and the 1965 and 1971 wars with Pakistan. It was not until after the Oslo process began though, that the limited military contacts developed into a fuller strategic relationship. According to The Bulletin of Atomic Scientists, in 1994 “India requested equipment to guard the de facto Indo-Pakistan Kashmiri border. New Delhi was interested in Israeli fences, which use electronic sensors to track human movements” (Thomas Withington, “Israel and India partner up,” January/February 2001, pp.18-19). The remaining years of the decade were peppered with arms sales from Tel Aviv to New Delhi, most notably unmanned aerial vehicles (UAVs) and electronic warfare systems. Evidently, the strategic military relationship picked up steam in the new millennium and annual arms sales average in the hundreds of millions of dollars. However, the shift from Israel being a major defense supplier to a strategic partner was formalized in a September 2003 when then-Prime Minister Ariel Sharon visited India where the Hindu Extremist government of the Bharatiya Janata Party led by then-Prime Minister Atal Bihari Vajpayee was in power and hosted the Israeli delegation as well as co-authored the Delhi Statement on Friendship and Cooperation between India and Israel. The statement’s longest segment is on terrorism. 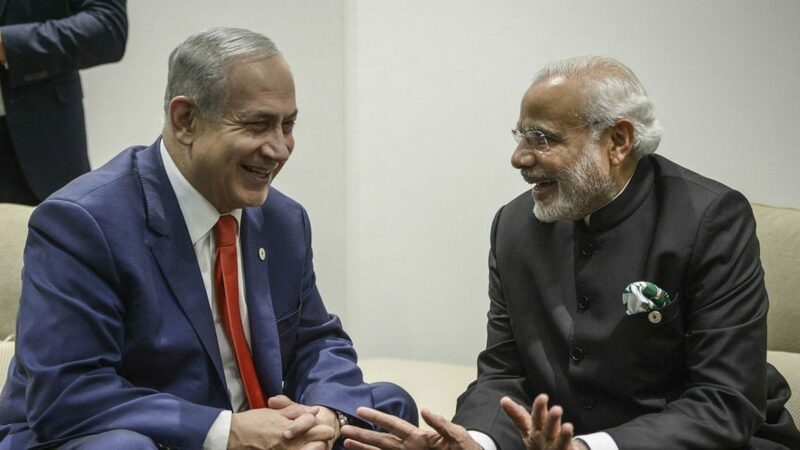 It declares that “Israel and India are partners in the battle against this scourge” and that “there cannot be any compromise in the war against terrorism.” The relationship has expanded dramatically since 2000. Surface-to-air missile systems, naval craft, advanced radar systems and other remote sensing technologies, artillery systems and numerous joint production initiatives ranging from munitions to avionics systems have boosted the relationship.This includes the border fencing is now in placeacross 550 kms out of 740 kms long ceasefire line called Line of Control, inspired by Israeli border security system [“Technologies used in Border and Perimeter Security- The Indian Context”, Lt Gen V K Kapoor, SP’s Land Forces, 10 Nov 2016]. The fencing is a double row of fence and concertina wire, 2.4 metres to 3.7 metres high, electrified and connected to network of motion sensors, thermal imaging devices, lighting system and alarm. As is becoming clearer, there is a larger picture being painted here which we should turn our attention to. The trends of military and security infrastructure and equipment exchange between India and Israel are rooted in the ideological affinity between the two. This affinity is with respect to militarization of civilian life, repression of political dissent, mass surveillance and securitization couched in the language of ‘counter-terrorism’. In 2004, the Israeli intelligence agencies Mossad and General Security Services (Shin Bet) arrived in India “to conduct the first field security surveillance course for Indian Army Intelligence Corps sleuths.” The Globes article on the topic cites an Indian source stating “The course has been designed to look at methods of intelligence gathering in insurgency affected areas, in keeping with the challenges that Israel has faced.” The further acquisition of UAVs, their joint production and the acquisition of other surveillance systems, notably 2010 agreements for both spy satellites and satellite communications systems, have all helped to further India’s pacification campaigns in Jammu and Kashmir. A notable example of how deeply embedded in India the Israeli counterinsurgency and homeland security industries are is the May 2010 agreement whereby Ra’anana-based Nice Systems was to provide security systems and a command and control center for India’s parliament. Indian Parliament security head Sandeep Salunke noted the context for the $5 million contract being “In light of the recent increase in global terrorism” (Nice Systems press release, 25 May 2010). The adage that it is not weapons that kill, rather it is a person who kills becomes meaningful here, because, ideas and motivations drive the use of weapons. For instance, as far as Government of India is concerned, India is fighting a “proxy war”against Pakistan in Kashmir and therefore, regards all those who support the call for Freedom (Azaadi) to be anti-national i.e. traitors as well as terrorists or supporters of terrorists and terrorism. Apart from the fact that struggling people are robbed of their history, motivation and context once rebels/insurgents are abused as working for an enemy country. India’s Prime Minister Narendra Modi in an interview he gave to “Israel Hayou” (Tel Aviv) on June 04,2017 said that “India and Israel are not immune to it (terrorism). We are in full agreement that element which perpetrate violence on innocent people should not be allowed to flourish”. The importance of this becomes evident when we see how rapidly military ties have grown from transfer of military equipment and components to include ‘Counter Terror’ as well as Policing. And reaching “full agreement” with Israel over such “elements”that “perpetrate violence” is evidence of close ties. In so far as policing is concerned Indo-Israel cooperation formally began in February 2014 when an agreement was signed on ‘Cooperation on Homeland Security’ and a joint Steering Committee set up. The first meeting of the joint committee took place in Israel in September 2014 and constituted several working groupson border management, internal security and public safety, police modernization and capacity building for combating crime, crime prevention and cyber crime. More significantly, All India Police Services trainee officers after completing their year-long course at India’s National Police Academy spend a week in Israel on an “exposure tour”. What exactly they are exposed to remains official secret. However, reportedly[“IPS officers visit Israel to learn best policing practices”, The Economic Times, 13 July 2018]Indian officer trainees are exposed to Israeli border control management, practices and methods.These include Israeli expertise at monitoring social media to intelligence gathering as well as taking prompt action without bothering about consequences. To sum up, while India-Israel relations are close, a word of caution is due here. India’s own record of waging war against our own people in different parts of the country is old and Indian Army itself has, in its incarnation as British Indian Army, a long history of waging military suppression at behest of East India Company and then the British Empire. So, it would be an exaggeration if Israel is burdened with prime responsibility for the brutal military campaign Indian army has been waging in Kashmir. India has turned to Israel to upscale its Counter Terror including Counter Insurgency operations and bring in “efficiency”, fine tune methods, introduce new practices. It is here that accusing civilians of being combatants for even voicing their opposition or protest comes into play. Blaming Pakistan for waging ‘proxy war’ in Kashmir turns everyone protesting in Kashmir into ‘anti-national’, supporter or sympathizer of ‘terrorists’ and therefore, fair game for armed forces to target. Use of pellet guns aimed at eyes or vital organs have turned hundreds of young persons in Kashmir blind or near blind and have caused many fatalities because a person is sprayed with pellets. Where Israel figures is that its “successes” have become the new standard for repressive governments to emulate and follow. Border fencing, sensors to plug loopholes to prevent infiltration and exfiltration are one part of the package. The other comprises training of personnel, exposing them to methods deployed by Israel’s militarized police force, so called counter-terror practices come into play. In other words, Israel provides a ‘cutting-edge’ system. Training of police, military and militia. Systems of surveillance used to criminalize populations considered potential threats to the legitimacy or security of repressive states and regimes. This information is used for mass incarceration, deportation, assassination, torture and forced removal to secure land or resources. Methods of isolating populations through forced migration and destruction of land into concentrated areas whose air space, borders/parameters and telecommunications are controlled. Militarized borders and border technology used to prevent freedom of movement. Finally, while every war has its own specific context and no two wars are identical, there are similarities between Palestine and Kashmir which cannot be ignored. For me it is not just the fact that both are ‘occupied’ territories rather it is the fact that just as in Palestine so it is in Kashmir, there is tremendous support for militants/armed groups. A retired IPS officer and a senior officer of Research and Analysis Wing (RAW), Vappala Balachandran, wrote in The Indian Express [April 27, 2018] talking about Kashmir militancy, hedrew attention of readers to the fact that “this type of public support” for militants where people gather “is seen only in Palestinian areas of Israel”. What struck him as well as other observers was the new phenomena where people rush to site where encounter between military and militants happen, they shout slogans in support of militants, and against the Indian military, some throw pebbles on solders, they sing songs to boost the morale of the militants and often help them to escape. These are not handful of civilians at site of army operation but hundreds and sometimes they number more than thousand. This trend began in 2014-15 but since a militant hero 22-year-old Burhan Muzaffar Wani was martyred it has spread. What this means is that although militants are no more two three hundred their force gets multiplied many times over due to people coming out in their support. There are several other features in common. Both were born out of end of the British colonialism, seen as occupying front lines in the “War on Terror,” and where the Kashmiri and Palestinian resistances are demonized. The widespread abuse and atrocities committed by Indian and Israeli forces and both the Indian and Israeli public’s general apathy about or hostility towards Kashmiri or Palestinian self-determination respectivelybrings out several commonalities between Kashmir and Palestine. Of course, unlike in Israel, in Indian domestic discussion Kashmiri self-determination isn’t even an issue, though pacifying Kashmir and securing the border with Pakistan is. To cut a long story short, relations between India and Israel go beyond military hardware and systems. Israeli influence and allure of its Counter Terror and Policing methods and approach show how comprehensive they have become.The difficulty we face is that ideas and perspectives are not tangible and more difficult to track. Neither India’s Defense nor the Home Affairs Ministry offer anything more than a cursory reference to visits of this or that delegation, but nothing about the contents of their talks. Gautam Navlakha is a human rights activist and a journalist. Artillery, Air Force and Naval ships Part of Defense Secretary’s visit to Israel in 2014. Intelligence sharing agreement to ‘fight radical Islamic extremism’ together also signed during this visit. Aug 2017 Comprehensive Integrated Border Management System Israel developed Border Security Force and Army: Along the border with Pakistan. Plans for sealing all of the 6300 km long borders with Pakistan and Bangladesh with this ‘smart fence’. Monitored by sensors and security cameras to detect breaches. Perhaps initiated during Rajnath Singh’s 2014 visit to Israel. Nov 2017, India participated in Israeli Blue Flag military exercise for the first time. Prepared by Apoorva Gautam, BDS (India). Nice Systems is essentially a big data company, handling cyber security solutions for trade and finance. It also manages ‘public safety’, which includes CCTV surveillance, phone and radio systems, record management, etc. This aspect of its work is closely linked to public service providers, and therefore the scale of data it deals with gives rise to serious concerns regarding privacy and surveillance, which also came up when data of millions of Verizon customers was leaked, which was being handled by Nice Systems. There are four offices of Nice Systems in India. How does one count yearning? I call out to you— fa les teen! Will you look for us if we don’t return?